Some projects are instantaneous, you have an idea and virtually storm into the house, pushing animals and small children aside to get to your yarn stash. Immediately you begin casting on, or making a magic ring and there it is; a compulsive project. Fun and immediate. Other projects take months, perhaps even years to gestate and become a real item. This was very true of my Marius Cardigan I finished just a few days ago. Back in October 2016 I attended a ‘Steeking’ class at Black Sheep Wools with my lovely friend and tutor Juliet Bernard. Not only did she provide me with confidence that you could cut knitting, she also taught me how to do two-handed double stranded knitting. 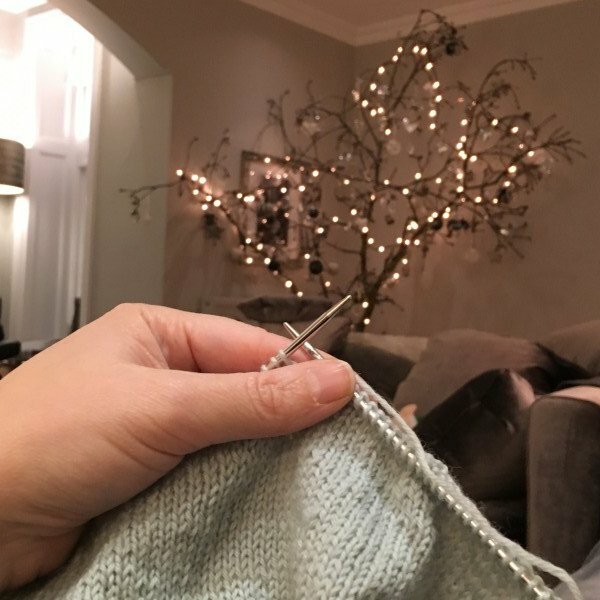 If you have followed my blog at all last year, you will know this was a personal delight, a revelation and has opened up many more opportunities with my pattern choice. 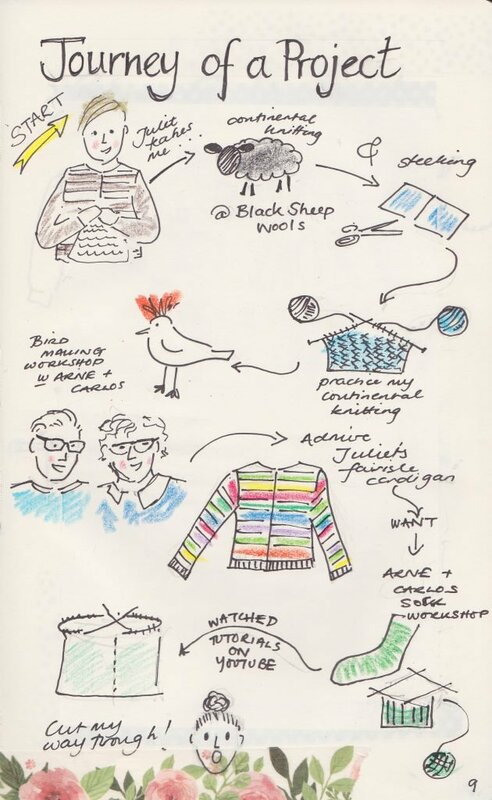 Throughout the year I built up my knitting skills, attending a bird making class with the sublime Arne and Carlos and then a sock making class. Around this time I admired a beautiful fairisle cardigan that Juliet had completed. I had cardigan envy let me tell you…an obsession developed. Juliet explained how much easier it was to knit a garment like this in the round and to then cut in the arm holes and the button band. 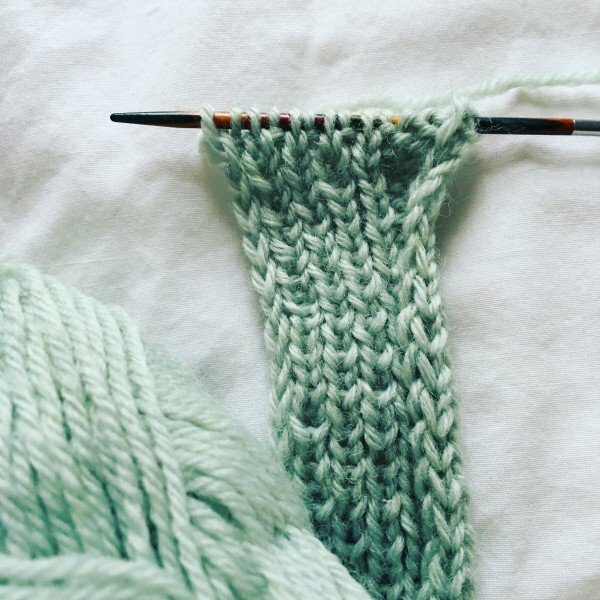 I started watching a few more steeking tutorials. Arne and Carlos have a series of four videos on their You Tube Channel. 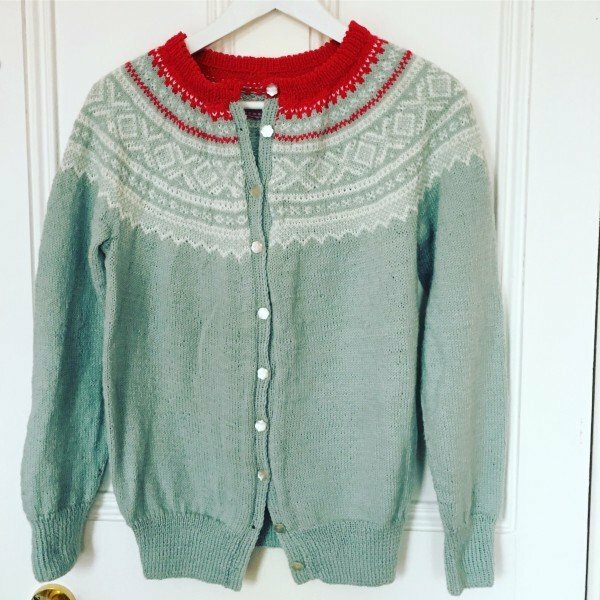 So there I was sitting in the Arne and Carlos sock workshop, chatting away to other students and I started admiring a beautiful cardigan worn by one of my fellow knitters. 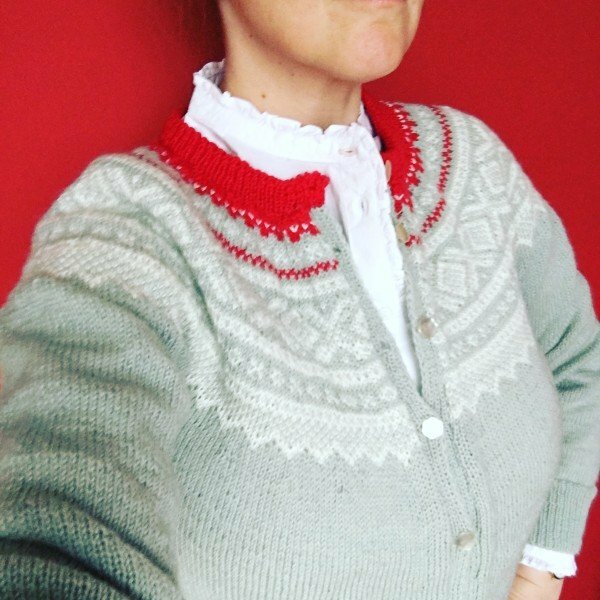 She told me about the way she learnt to knit in the Norwegian style and signposted me to the lovely pattern shop, Scandinavian Knitting Designs. I knew then that I needed to embark on my most courageous project yet, choosing the traditional Marius Design and settled on a Duck Egg and Red colour combination. Right in time for the festive period started the project back in the first week of December. I wish I had recorded the date! The gauge is quite small, with the rib made with a 2.5mm needle and the main knit stitch uses 3mm circular needles. 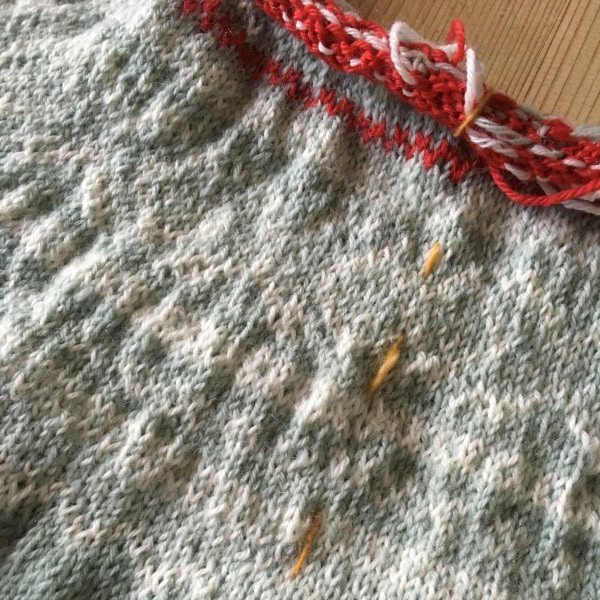 I embarked upon the two sleeves first and then worked the body of the jumper. There is a certain moment when you work across the body and then incorporate the two sleeves to create a unified yoke. Have I lost you at this stage? Throughout the whole process I wove a yellow guideline up through the centre of the work. Marking where I would eventually cut my material. After weeks of plain knitting I couldn’t wait to work on the intricacies of the white colour work. Knitting line by line is quite obsessive. I find the concentration required an enjoyable discipline. Your mind cannot wander onto any other topic. Eventually when I had finished I placed a line of yarn into the very last stitches of the collar. I then made two placket button bands. 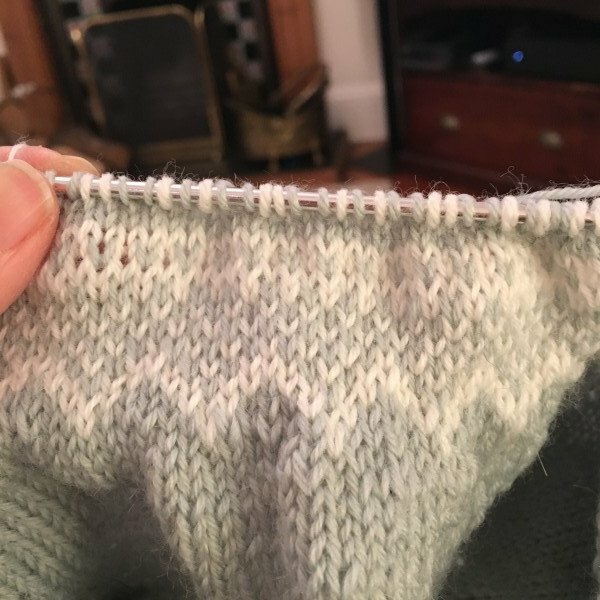 The genius of the Norweigan style is that you not only make a rib button band but also a stocking stitch lip which will cover the edge of your cut opening. It was quite a few days before I had the courage to make the cut. I am not sure what I was more scared of; using the sewing machine to snarl up my knitting or taking the scissors to my work. On each side of the guide like I made two zig-zag lines with the trusty sewing machine. Then in the daylight I used the scissors to cut open the front of my cardigan. You can watch a video of my cutting the knitting if you like. My heart was in my mouth. I used my sewing machine to attach the button band and folded the lip over to cover my exposed cardigan edges. Finally I picked up the stitches of the collar and attached the buttons. It is at this stage that there is a temptation to wear your newly created garment. But we must all resist and add the finishing touch of blocking the knitting. Experience has taught me what a difference this last step makes to the final look of the garment. There are two big questions: am I pleased with the finished work? Yes I think so – it is a little snug on me…. 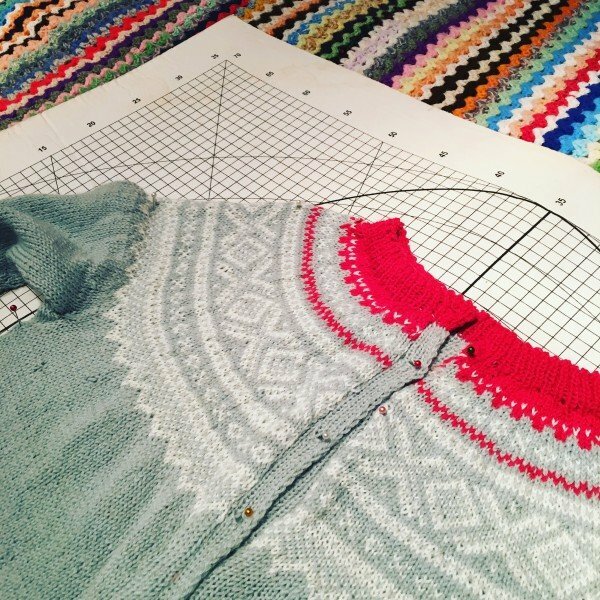 perhaps not the most flattering shape for my figure, but the fairisle pattern is very pleasing. Would I use this technique again? Oh yes definitely, I have no fear at all now. It makes utter sense to work in the round, so much faster and you have no pesky seams. 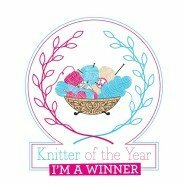 I will be taking my scissors to my knitting again. This may be my first cut but it wont be my last. Wow! Loved watching the video, I could feel your fear, but it worked out perfectly! Hi,it is my birthday tomorrow,my husband has just given me your book,”Cute Crocheted Animals”,which I have wanted for ages.So excited can’t wait to start. I have posted your book on my blog.